The Kansas City Symphony kicked-off another season this past weekend at Helzberg Hall. I decided to go to the Sunday performance. "Kick-off" is an apt term for this weekend because the Kansas City Chiefs also had their home opener this afternoon as well. I wondered if that would have any effect on the size of the audience for the Symphony. To my eye, it did not. The hall was very full. I admit that as a classical music geek, every time I go to a concert, it's a big deal for me. But the opening weekend of a new season has a special energy to it...kind of like "back to school" or Opening Day for baseball. The program got underway with Mr. Frank Byrne, the Executive Director of the KC Symphony, taking the stage to welcome us to the concert. Mr. Byrne always brings an air of class, dignity, enthusiasm, and positive energy to these concerts...as well as delivering the all too necessary "turn off your cell phones and don't take photos during the concert" reminders. But on this day, the first Sunday concert of the season, he also invited us to stand and take part in what has become a marvelous tradition at the Symphony...a rousing rendition of the Star Spangled Banner. Maestro Stern led the occasion facing the audience and flag from the podium...and he is singing with true gusto and vigor. I have a lot to tell you about the rest of this amazing program, but honestly, this moment each year has become very special to me. Everyone sings and fills this incredible hall with such energy and emotion. It is quite special. Bravo. The program this weekend featured pianist Natasha Paremski playing the Rachmaninoff Piano Concerto no 3 in D minor, so we can start there. It was composed in 1909 to be played on his upcoming tour of the United States. It premiered on November 28, 1909. 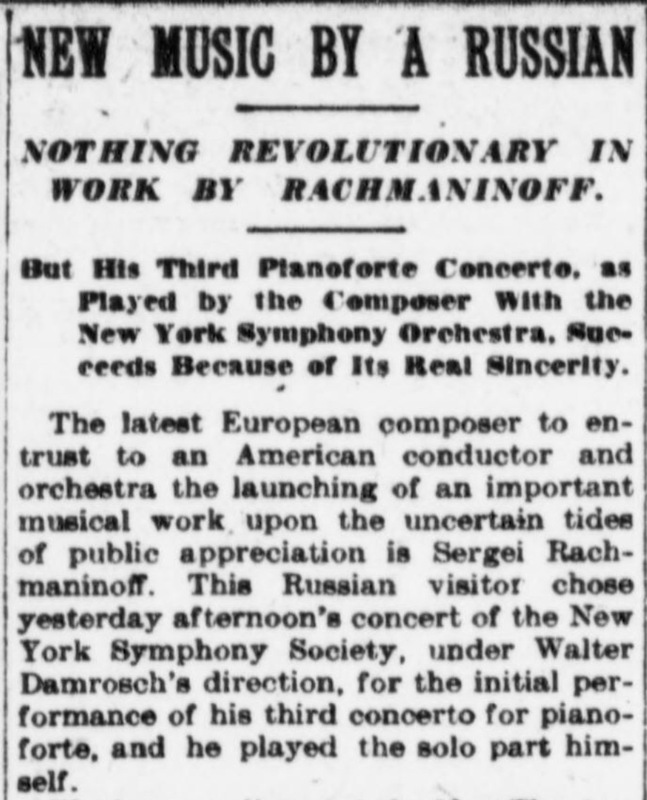 Here is the headline from the New York Sun the following day, and the review in the New York Sun when it was played by the New York Philharmonic on January 16, 1910, conducted by Gustav Mahler. 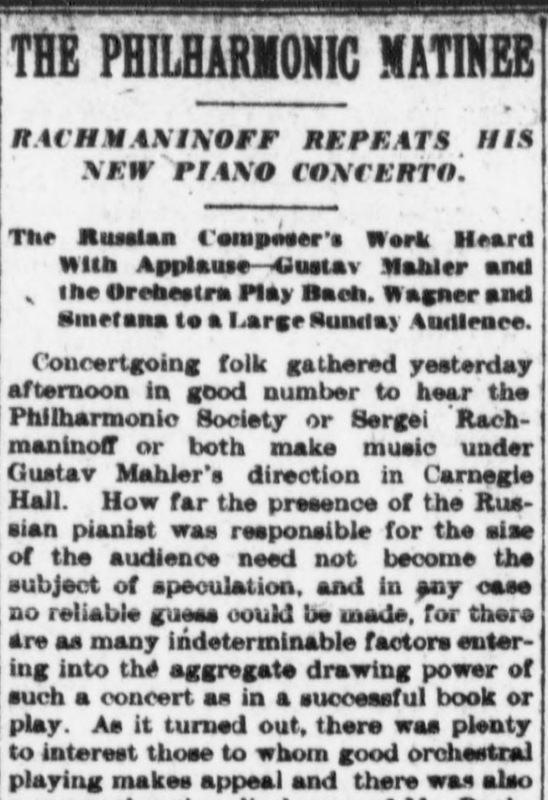 The critics and the audience responded favorably, but the initial consensus was, "The concerto was too long and it lacked rhythmic and harmonic contrast between the first movement and the rest of the concerto." I don't think so. I lose all track of time when I hear this Concerto. As I watched and listened, I was in awe of what was taking place in front of me. The sound was clear...warm and balanced. I know the Hall has something to do with this, but the soloist and the orchestra get my credit. One of my friends told me, after attending the Friday night performance, he thought the Rach 3 was OK, but the pianist beat the hell out of the piano and it didn't capture his heart like he thought it would. Another friend of mine also attended one of the earlier performances and said he burst into tears because it moved him so much. They both agreed that Ms. Paremski played flawlessly. I agree. And I would score it a TKO, Paremski over Steinway. That piano absorbed a healthy dose of abuse but never backed down. When she touched the keys to make it sing, it sang. Stern and the orchestra were perfectly in sync with her. I think Rachmaninoff's orchestration deserves almost as much credit or discussion as his piano composition. And an orchestra has to be able to weave in and out...above and below...the piano. KCS did this perfectly. One thing to note; as powerful as this orchestra is, the KCS plays SO well at pianissimo...and with equal intensity as at forte....not many orchestras can do that. 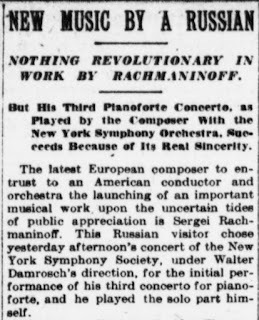 Anyway...I kept asking myself...where did Rachmaninoff come up with this Concerto? What's behind it? Where did it come from? Others have asked the same thing. 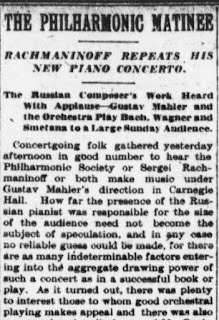 I found a quote from Rachmaninoff when he was asked if the Concerto has roots in Russian folk music or liturgical influences? He spoke to this: "The first theme of my Concerto is borrowed neither from folk song sources nor from church sources. It simply wrote itself." Hmmm...wrote itself. That does not compute for me. A mortal human sat down and wrote this music.....no way. Humans can't do this, right? Well...that human did. This Concerto is in a class by itself. Don't get me wrong, his other Concertos, especially no 2, are also wonderful. But this one is different. It challenges the musicians and the listener on a higher level than does no 2....listen to them both and tell me if you agree. Ms. Paremski showed that she possessed the full range of technique and expression necessary to frighten you with the Concerto's ferocity, and then immediately melt your heart and bring you to tears with its passion. Her tenderness was my favorite aspect of her playing. After the Concerto was over, the Hall erupted in applause..a standing ovation. Ms. Paremski, Maestro Stern and the musicians took their bows repeatedly. It seemed from my vantage point that they all felt good about what had just happened...and they should. After intermission, Maestro Stern introduced the newest members of the orchestra. He then talked about the next piece, Odna Zhizn, by Christopher Rouse. This contemporary work may seem out of place on a program of Russian giants such as Rachmaninoff and Rimsky-Korsakov and Stern admitted as much. But Rouse's wife is named Natasha, just as our piano soloist....nope, that's not going to correlate. And I am not sure if it matters....I liked this piece. It tells a shocking story of a horrible act...a woman, the composer's wife, brutally assaulted. Homeless. Lost. Hopeless. But then it becomes a story of triumph over adversity. Of forgiveness. Musically speaking, it is rich and powerful. Sixteen minutes of music that wrings your heart. Erie glissando, prominent use of a celeste, which was made most famous in the Romantic tradition by Tchaikovsky...a Russian.... marimba, rhythmic intensity. It worked for me. One of my friends I mentioned earlier said he thought this piece sounded like a horror movie soundtrack. Maybe. But I would also say it is the music to a love story. Rimsky-Korsakov's Capriccio Espagnol is a brilliant work..a crowd pleaser...a classical "rock show." Infectious melodies and rhythms dominate. "According to my plans, it was to glitter with dazzling orchestral color." -RK. It does just that. He dedicated this piece to the St. Petersburg Opera Orchestra, with whom Capriccio Espagnol was first performed on October 31, 1887. And all of this happened on the first weekend of the 2017-18 Kansas City Symphony Season!! When it starts this good, one can only fantasize about how great the rest of the season will be!